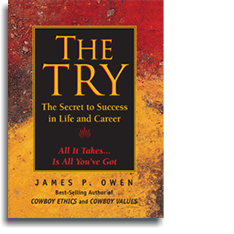 In standard English usage, ‘try’ is a verb that means ‘to make an attempt.’ But in cowboy culture, the word is a noun invested with profound meaning. When Cowboys say, ‘That cow hand, he’s got try,’ they’re talking about the quality of giving something every ounce of effort you can muster. The TRY is that burning desire to accomplish something, coupled with the belief that you can do it, and the determination to give it 110% effort every day. In short, The TRY is attitude plus effort — and when you think about it, those are the only two things in life that we can control. The truth is that success doesn’t depend on IQ, talent or connections. It’s all about The Try — and if you’ve got it, anything is possible. 1) Start with a dream.